Not pictured: cat who bolted as soon as I pulled out the hair dryer. Step 1: Put one boot on, and zip it up almost as far as it’ll go on your leg. Step 2: Set your hair dryer to high heat, and turn it on. 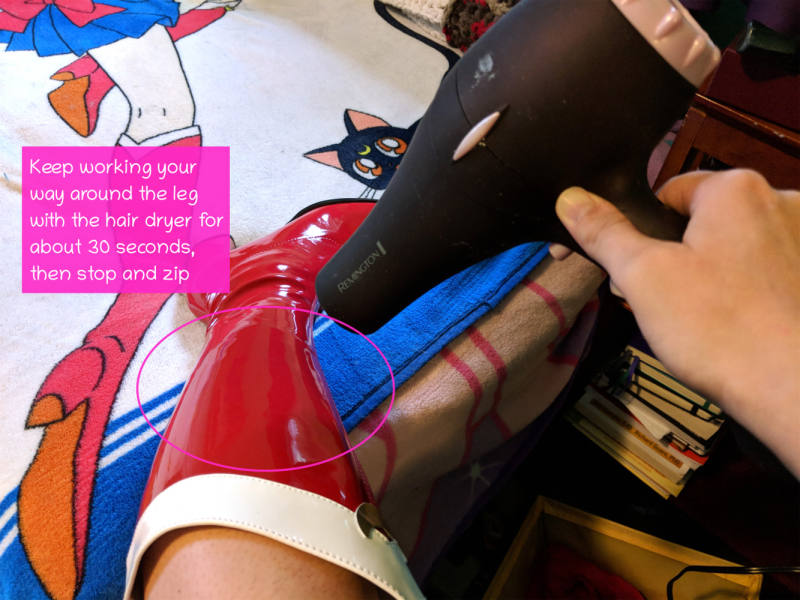 Heat the section of your boot just above where the zipper is for about 20-30 seconds – go all the way around your leg to help warm up the vinyl and encourage it to stretch a bit. If your leg – especially the exposed part – gets too hot, it’s time to stop. Step 3: Carefully pull the zipper up through the area you just heated. You should be able to get it up through that area easily. Managed to get it zipped up a little more, thanks to the power of heat! Step 5: Repeat step 3, pulling the zipper through the newly heated area. Keep working through steps 2 and 3 until you’re able to zip your boot all the way up. Once you’ve got the first boot done, it’s time to do the next boot – just follow the same process you did for the first one. After you’ve got both boots stretched out, wear them for a little bit to help them keep their shape. (I left mine on for an hour after I first stretched them.) You’ll likely need to repeat the process a few times before they retain their shape permanently, so don’t be surprised if you put your boots on a few weeks after you’ve stretched them the first time and they don’t quite fit perfectly. If you don’t have a high tolerance for heat, be careful and only do small sections at a time with a bit of a break in-between, or try using a lower heat setting. 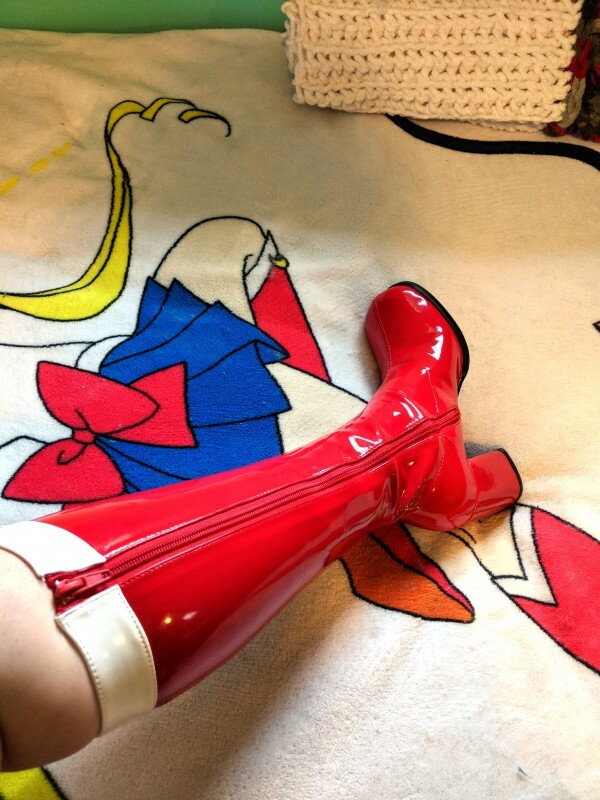 Please don’t burn yourself – I know that sometimes cosplay involves pain (especially with shoes! ), but you don’t want to end up hurting yourself before the event you’re cosplaying at. Don’t use a heat gun (usually used to help shape Worbla or other cosplay materials) on your boots. You’ll probably melt them and seriously injure yourself. Again, please don’t burn yourself. 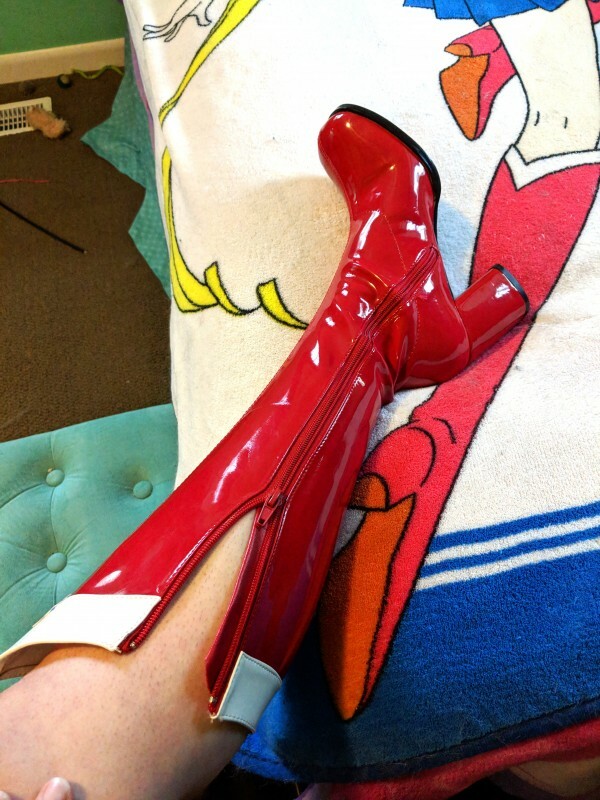 If you’ve tried the stretching method I’ve described and your boots still haven’t stretched enough to fit properly, you might need to try a different pair of boots. Don’t try to overheat the vinyl, or try to cram yourself into something that doesn’t fit properly – you’ll likely end up hurting yourself, and that’s no good. 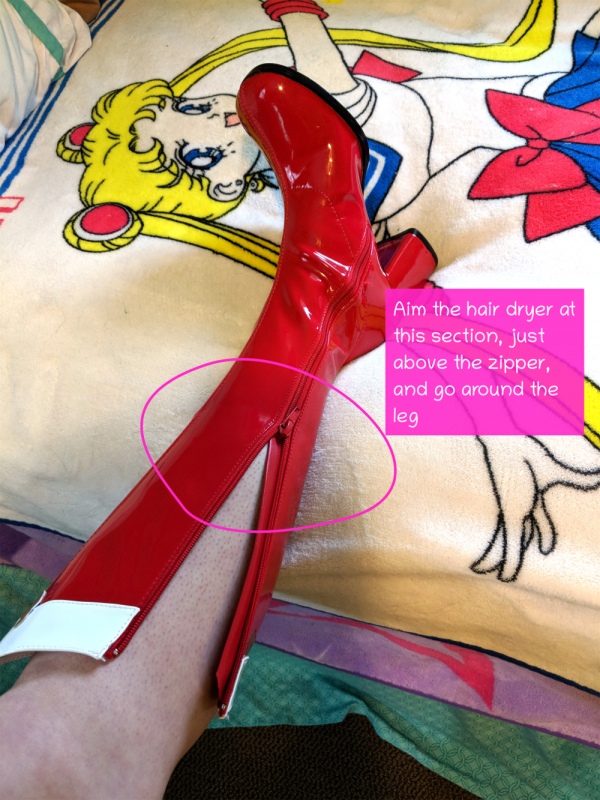 Since you’ll be aiming a hair dryer at your legs for a fair amount of time, you might want to set yourself up someplace where there’s a fair bit of airflow so you don’t overheat. My first stretching attempt was done in my tiny bathroom, and I got warm pretty quickly in there – even with the door open. 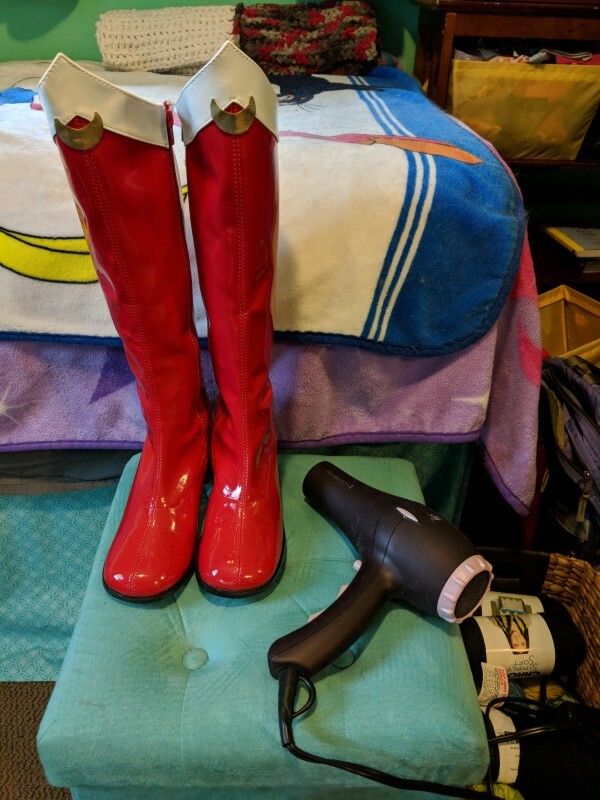 Hopefully this tutorial will help other cosplayers with their vinyl boots – even if they just need a little bit of stretching to make them fit properly!